An unexploded World War II bomb started to tick and ooze liquid as experts tried to defuse it, police have said. The large bomb was found in a river at Sugar House Lane, near Bromley-by-Bow Tube station in east London, on Monday. Rush-hour travel was disrupted as overnight work to make the bomb safe continued into Thursday morning. Police commander Simon O'Brien said: "It started to tick and ooze some pretty horrible substances." It stopped ticking when doused with liquid. Ch Supt O'Brien said the military disposal team's work over-ran because "the risks got greater and greater". 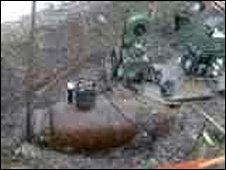 "This is the largest World War II bomb to be discovered in the past three decades. "It measures approximately the size and length of a man, and weighs around 1,000kg (2,200lb). "One of our hero colleagues from the Royal Engineers went back into that bomb four times, which is extremely unusual," he added. "I think he was very brave." A 200m (656ft) cordon is in place around the bomb and rail services will be disrupted again when the bomb is removed between 2200 BST on Thursday and 1000 BST Friday. District and Hammersmith and City Tube lines and C2C train services will be affected. "Military experts will remain on site until the device is deemed to be completely safe and is removed," a police spokesman said.